For nearly 100 miles, you can experience the sweeping panorama of the Allegheny (Kinzua) Reservoir, endless stands of hemlock and pines, towering glacial rock cities with breathtaking vistas as the North Country Trail (NCT) winds its way through the wilderness of the Allegheny National Forest (ANF) in the Pennsylvania Wilds. Except for the occasional drone of a commercial aircraft 35,000 feet overhead, you will forget all about modern civilization. This part of the Pennsylvania Wilds is often described by veteran backpackers as high-quality remote hiking. The North Country Trail crosses through seven states. From the New York/Pennsylvania border, the ANF NCT travels along the shores of the Reservoir, to the Tionesta Scenic Area, to Minister Creek Valley and eventually toward Cook Forest & the Ancients. Crossing native brook trout streams and traveling trails that were once logging roads and abandoned railroad beds, you trek through the Allegheny Mountains’ old and new growth forests and fields of lush vegetation, and discover artifacts from the region’s oil and lumber heritage. The NCT’s path through the ANF is a hidden gem of varied habitat and terrain. Just ask Tina Toole. For the past six years Tina, of nearby Warren, Pennsylvania, has been the Trail Maintenance Coordinator. Tina, along with husband Mike, who have both held many top positions in the organization, have hiked every inch of the 100-mile-long Trail. Today they spearhead the volunteer effort to keep it cleared and open. Tina says the trail has something for everyone, regardless of their hiking/backpacking skill-set and, grabbing a trail map, she offers a few ideas for beginners and seasoned hikers. Enjoy a hike from Minister Road to Henrys Mills. Rolling hills take the trail through three lovely creek valleys filled with abundant wildlife and wildflowers. Rock cities can be found up close to the ridgelines. Great camping is found in all three valleys, and a shelter is located on the Upper Sheriff Run. Farther along, camping is also found along Pell Run and Messenger Run. Tackle the more challenging Tracy Ridge area with its stunning views of the Allegheny Reservoir, beautiful bays, streams and majestic forests. The Tracy Ridge area is a large roadless tract allowing for solitude and tranquility. 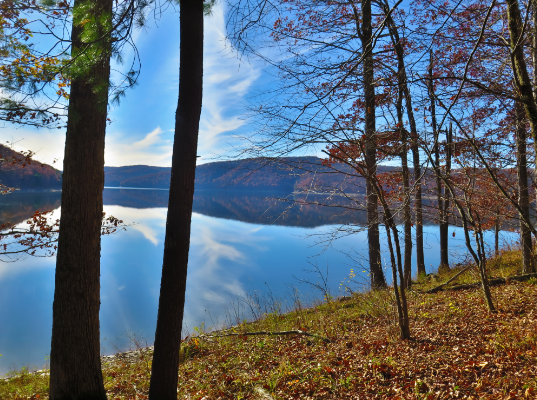 Great camping is found along the shore of the lake at Tracy Run, Johnnycake Run and Handsome Lake campground consisting of a stretch of 11 and a half miles. Hikers can start at the Sugar Bay Trailhead on Route 321, (N 41° 53.399’ W 078° 53.170’) and end at the Route 346 Trailhead, (N 41° 59.075’ W 078° 54.145’). Photo credit: Shelby Gangloff. There are more than two-dozen marked campsites along the trail. Campgrounds maintained by the U.S. Forest Service are available. Aside from the usual dry stretches across the ridgelines there is plenty of water available on the ANF. There are creeks and a few mountain springs in the valleys, and you will want to make sure you treat all your water. There are parking spots where the trail crosses state highways, and most of these areas are equipped with trail registers and kiosks. As for restocking your supplies, the area is somewhat remote, cell service is spotty, at best, and there are very limited resupply opportunities along the NCT in the ANF. Maintaining the trail requires hard work on the part of volunteers, and having enough volunteers is their biggest challenge. Monthly work days on the trail are the norm, and Tina and crew can always use more people. “Trail work days are a lot of fun. 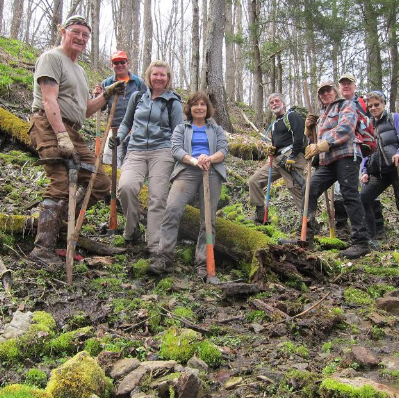 We get the satisfaction of improving the trail and at the same time have a chance to meet and network with other hikers,” she said. Photo credit: Tina Toole. With 100 miles of trail to keep up, she said the chapter could do an even better job if hikers would consider helping them for a day or adopting a section of trail. “Volunteers are also needed to help with things like: organizing events, leading hikes, flipping burgers at the 50-Mile point of the A-100, doing publicity and holding leadership roles,” she said. The A-100 (Allegheny Hiking Challenge) held every June is the ANF-NCT’s signature event, designed to introduce hikers to the trail and to encourage volunteers and funding. 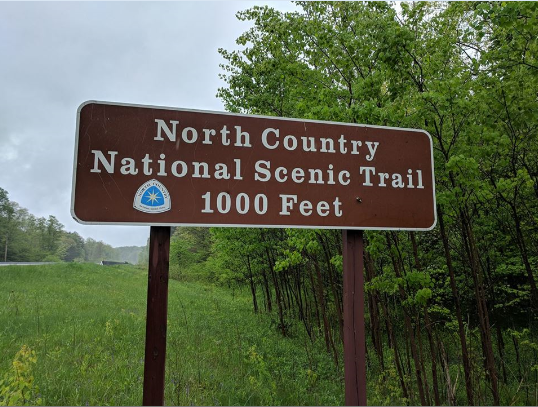 She is quick to note the great working relationship the organization has with the National NCTA (North Country Trail Association), National Park Service staff, and the ANF U.S. Forest Service personnel. “These people support us in many ways, they provide grants and equipment, they share information and knowledge. They make our task easier and more enjoyable,” said Tina. The NCT continues onward southbound out of the ANF toward Cook Forest and home to the Clarion County Chapter of the North Country Trail. The Eastern portion of Clarion Chapter’s section of the Trail starts at the southern border of the ANF and ends near the Clarion County Airport outside of Clarion. This is 35 miles of beautiful back-country trail featuring hikes along the National Wild & Scenic Clarion River and the scenic Toby Creek watershed, traveling through two tracts of Clear Creek State Park, Cook Forest State Park and multiple State Game Lands. Highlights of this section of the trail include: majestic old growth forests, the National Wild & Scenic Clarion River, multiple opportunities for wildlife viewing, along with cascades and waterfalls on beautiful streams. The Western portion of Clarion Chapter’s section of the North Country National Scenic Trail starts on State Game Lands 63 near the Clarion County Airport and ends at the trail crossing of the Allegheny River in the town of Parker, Pennsylvania. Along most of the 50 miles of trail, the NCT shares a pathway with the Allegheny Valley Trails Association’s Clarion Highlands, Game Lands 45, Sandy Creek and Allegheny River Trails. Whether it be the ANF or the Clarion North Country Trails, no matter which trail you choose or how far you plan to hike, always make sure you have a good map and file a “trip plan” with a friend or relative so they know exactly where you’re headed and exactly when you plan to return. Even if you’re planning a simple day hike, you should have a day pack with trail map, water, snacks and a first aid kit. Have fun out there and above all, respect the trail. Always remember to observe “Leave No Trace” hiking and camping principles and remember the Leave No Trace cardinal rule: Pack it in, pack it out.